Today, I wanted to look at quarterback-to-receiver target tendencies from this preseason to look for potential 2018 draft-day fantasy football takeaways. Intuitively, if a quarterback heavily targets one specific receiver over all other receivers on the team during preseason, we might expect this to carry over into the regular season. I suspect this matters more for quarterbacks on new teams – considering there is typically no previously established rapport with any of the receivers. Still, it might not matter, because preseason football, of course, doesn’t matter. Furthermore, we’re dealing with an extremely small sample – in some cases less than a full regular season game’s worth of targets. Typically, I’d do a large in-depth study to test the validity of such a hypothesis, but in this case, with so many hidden variables at play, I’m not even sure how to go about such an exercise. That said, there is some circumstantial evidence to support this. Last preseason, Jared Goff targeted Cooper Kupp on 8 of 30 attempts (26.7 percent), as did Brian Hoyer targeting Pierre Garcon. This led to an ADP jump for Kupp that paid off, and Hoyer targeted Garcon on a whopping 23.3 percent of his throws last season. In 2016, Jay Cutler targeted Alshon Jeffery on nine of 28 (32.1 percent) of his preseason pass attempts. In games both played that year, Jeffery saw a near-league-high 27.0 percent target market share. In 2015, Ryan Fitzpatrick targeted Brandon Marshall on 11 of 34 preseason pass attempts (32.4 percent). In the regular season, Marshall finished third at the position in total fantasy points and with a 25.3 target market share when Fitzpatrick was under center. Take the following chart and accompanying analysis with a grain of salt. It might matter — I suspect it does to an unknown degree — but can’t quantify or prove it. Note 1: Target market share (targets divided by total targets) is an important and highly valuable metric for fantasy football. Of the top-20 fantasy players by receiving fantasy points last year, only Rob Gronkowski had a target market share less than 19 percent (18.1 percent). There were only 32 players with a target market share over 19 percent last year. Note 2: An asterisk next to a quarterback’s name in the below analysis indicates a new arrival to the offense. I highlighted Sanders as one of “My Guys” earlier this month, based on historical production, a perceived improvement at the quarterback position, and the fact that drafters were neglecting the fact that he played hurt for the majority of last season. Since then, his ADP has jumped four spots, but he’s still a strong value. Sanders has easily been Keenum’s favorite target this preseason, comprising a whopping 43.8 percent of Keenum’s total aimed throws. Granted, Sanders has run more routes with Keenum than fellow wide receiver Demaryius Thomas (37 to 25), but even with that factored in, it hasn’t been close. Sanders averages one target every 2.6 routes with Keenum this preseason, while Thomas has averaged one target every 5.0 routes. Sanders also totals 88 yards with Keenum to Thomas’ 18. I still have Thomas above Sanders in my rankings, though Sanders keeps inching closer. It wouldn’t shock me if Sanders outscores Thomas this year – after all, they finished only seven targets apart in 2016. Of course, this is just preseason, and it might not mean anything, but I think if this data is especially useful for new quarterback arrivals. 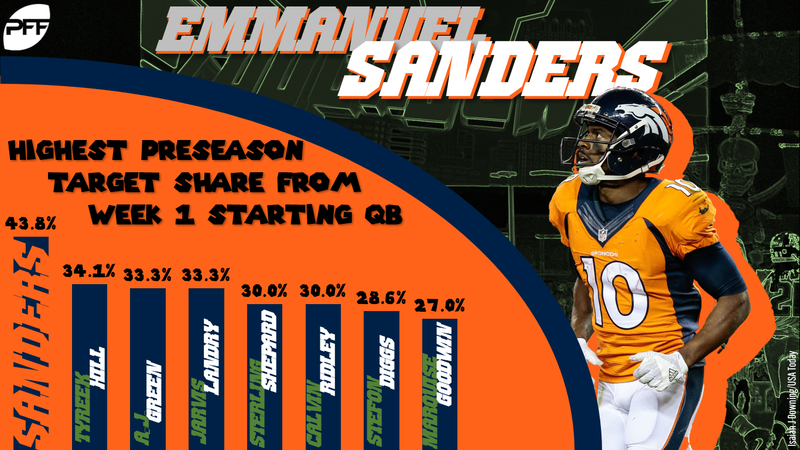 Neither of Thomas or Sanders has ever caught a pass from Keenum before this offseason and, as we’ve noted before, some quarterbacks have glaring (and consistent) target tendencies. Sanders has also run more out of the slot this preseason (64.9 percent of his routes, compared to 21.2 percent last regular season). Keep in mind, Adam Thielen finished eighth in fantasy points last year serving as Keenum’s primary slot option (51.1 percent of his routes). In this instance, the clear rapport Keenum and Sanders have shown this preseason has resulted in a rankings bump for Sanders (from me), though, considering it is just preseason and a small sample, I don’t necessarily consider it a major concern to Thomas’ draft stock. He too is a strong value at ADP (WR21). Like with Keenum, Mahomes is a new face in a familiar place, so I’m going to read a little bit more into his preseason chemistry than I would for most other quarterbacks. This preseason, all of Hill, Travis Kelce, and Sammy Watkins have run between 46 and 48 routes with Mahomes under center. Hill totals 14 targets to Kelce’s eight and Watkins’ seven. On those targets, Hill totals 183 yards to Kelce’s 78 and Watkins’ lowly 15. Hill is arguably the best deep-ball receiver in the game and I’m excited to see what he can do with Mahomes and his apparently generational arm strength. (Mahomes threw a touchdown to Hill this preseason that traveled 63 yards in the air. Aaron Rodgers is the only other quarterback to have done this over the past decade.) Meanwhile, Watkins is someone I keep moving down my rankings, despite the big offseason contract. I wrote about him earlier in the week, here. I’m not reading too much into this. For whatever reason, Dalton has always locked on to Green during the preseason. In 2017, Dalton targeted Green on 13 of 28 preseason pass attempts (46.4 percent). In 2016, Dalton targeted Green on eight of 24 preseason pass attempts (33.3 percent). This is something to keep in mind next year for all preseason DFS players but not something that has impacted my pre-draft rankings at all. Taylor’s aimed throws were fairly concentrated between Landry, Njoku, and Higgins. It’s hard to take too much away from Taylor’s preseason tendencies, however, considering Josh Gordon missed the entirety of preseason. Still, it’s encouraging to note Njoku has played on 62 of the team’s 72 first-team snaps this preseason. That 86.1 percent snap share represents a massive jump in usage from last season, when Njoku played on only 46.9 percent of the team’s snaps. He’s rightfully a top breakout candidate at the position, and, keep in mind, tight ends do tend to break out in their second year. Taylor’s love for Landry this preseason is also encouraging and backs up reports from beat writers earlier this offseason. Landry is a tremendous value at current ADP, as outlined here, and perhaps he’ll benefit from Gordon’s absence this camp, by having the immediate rapport with Taylor that Gordon will have to work towards during the season. Of course, Baker Mayfield might assume Taylor’s status as starting quarterback at any point this season, but, in either case, both Taylor and Mayfield have been at their best when targeting slot wide receivers. It’s encouraging to note Ridley played with and was heavily targeted with Atlanta’s first-team offense, but I’m not reading too much into any of this, considering Julio Jones sat out for all of preseason. Like in our last section, there’s not much of a takeaway here with Odell Beckham Jr. sitting out for the entirety of preseason. Evan Engram too ran just 15 routes with Manning, compared to Shepard’s 32. Diggs, Thielen, and Kyle Rudolph all ran at least 34 routes with Cousins this preseason. Adjusting for total routes, Diggs saw one target every 3.7 routes with Cousins, compared to 4.8 for Thielen, and 17.0 for Rudolph. I suppose this backs up Diggs’ recent ADP jump, ranking 11th among wide receivers to Thielen’s 13th. I suspect Diggs and Thielen will both again be fantasy WR2s or better, and I think Diggs does have the higher upside to justify his ADP ranking over Thielen, but Rudolph (as outlined here) was a player I’ve been fading, well before even looking at preseason usage. McCaffrey, Olsen, and Devin Funchess all ran at least 33 routes with Newton this preseason. Normalizing this, McCaffrey averages one target every 3.7 routes, compared to 4.6 for Olsen, and 11.0 for Funchess. Rookie wide receiver D.J. Moore was in for only 12 of Newton’s 44 dropbacks. As we’ve discussed elsewhere, I’m buying in to the notion of McCaffrey being used as a bell cow in 2018. His preseason usage definitely supports this, playing on 59 of the team’s 66 first-string snaps this preseason. Olsen’s usage is encouraging following a disappointing and injury-plagued 2017, while Funchess’ usage is far more alarming. This is, however, I think a good representation for how I see the pecking order for targets in Carolina. I suspect McCaffrey and Olsen dominate targets while Funchess represents a distant third. He’s fine at ADP (WR38) but not someone I’m targeting, as outlined here. On 38 pass attempts, Tannehill has targeted Wilson 10 times, though Danny Amendola is not far behind with eight. Though, Amendola has run 11 more routes with Tannehill than Wilson. On a per-route basis, Wilson averages one target every 2.7 routes, to Amendola’s 4.8. On 24 routes, Stills ties Amendola with one target every 4.8 routes. Granted, all of this might be meaningless considering DeVante Parker has played just 11 snaps this preseason – though, his status is up in the air for Week 1. As much as I love Wilson, he’s unlikely to be worthy of a fantasy draft pick without a benching to Parker. Meanwhile, Amendola and Kenny Stills are both exceedingly strong ADP values, as outlined here (for Amendola) and here (for Stills). Earlier this offseason, beat writers were reporting Goodwin had cemented himself as the team’s top receiver, and his preseason usage supports this. Of course, he had already shown a strong rapport with Garoppolo last year, averaging 14.7 fantasy points per game in games he started last season. On 36 routes with Garoppolo under center this preseason, Goodwin has seen 10 targets, compared to six targets on 34 routes for Pierre Garcon. Meanwhile, no other receiver totals more than four targets from Garoppolo. Like with A.J. Green, I’m not reading too much into Jones’ preseason target market share dominance. For whatever reason, Jones has always been Stafford’s favorite target in preseason, recording a target market share of 37.1 percent with Stafford in 2017 and 30.8 percent in 2016. Hilton’s high target market share with Luck is not surprising in the slightest. However, one other things is: Luck’s abysmally low average depth of target this preseason (5.7), rehabbing from shoulder surgery. Hilton sports a near-league-high 13.2-yard aDOT throughout his career. While Luck’s timidity this offseason can’t in any way be counted as a positive, I suppose it’s somewhat encouraging he’s still going out of his way to look toward Hilton. 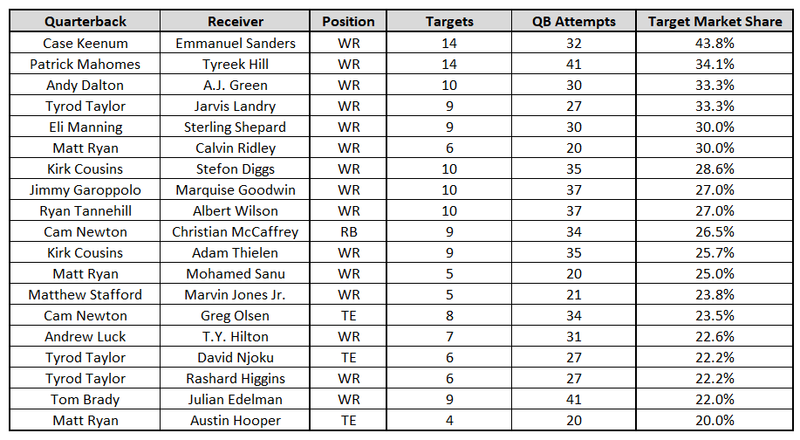 Edelman saw nine targets from Brady this preseason, but Chris Hogan (eight targets), James White (eight), and Phillip Dorsett (seven) weren’t far behind. (White totaled the most receiving yards with 78.) I suppose this is encouraging to see, as Edelman is returning from a torn ACL suffered in the preseason of last year, but considering there wasn’t much separating him from the other top receivers on the team, I won’t be reading too much into this. Though, I will say, Dorsett is probably worth a late-round flier in deep leagues.